Armageddon, helping the self, belief labels, ID, the JPL and more! Armaggedon date has been moved ahead! - The latest revision of the date when the world ends. Just what the world needs… - Another self-helping guide book. Labeling our beliefs - Are you atheist, agnostic, secular humanist or skeptic? Editor’s Choice: Intelligent Design is stupid - JerryB showed off his ignorance of algebra. “Do not go where the path may lead,” wrote Ralph Waldo Emerson. “Go instead where there is no path, and leave a trail.” That could be the motto of the Jet Propulsion Laboratory. Trailblazing has been the business of JPL since it was established by the California Institute of Technology in the 1930s. America’s first satellite, Explorer 1 which launched in 1958, was created at JPL. In the decades that followed, we sent the first robotic craft to the moon and out across the solar system, reconnoitering all of the planets. Pushing the outer edge of exploration, in fact, is the reason JPL exists as a NASA laboratory. In that spirit, this is an exceptionally busy period for JPL in laying new paths. In November, the Deep Impact spacecraft made a close flyby of a small, peanut-shaped comet, one of only a handful ever visited. In February, our Stardust spacecraft will fly by yet another comet. The asteroid belt will be the destination in July when the Dawn spacecraft arrives at the protoplanet Vesta, which it will orbit for a year before continuing on to the dwarf planet Ceres. In 2011 we will also launch four new missions — the Earth-orbiting Aquarius, Jupiter-bound Juno, GRAIL to Earth’s moon and our next flagship rover mission, Mars Science Laboratory. They will join our many current missions arrayed across the solar system. At the Red Planet, Mars Reconnaissance Orbiter is returning exceptionally detailed photos of the surface, while the Mars Exploration Rover mission keeps going far beyond original plans. The flagship explorer Cassini continues its orbits of Saturn, scrutinizing the ringed planet and its moons, including the haze-shrouded Titan in an extended mission. The Voyagers are exploring the edge of our solar system. A cadre of spaceborne telescopes look out beyond the planets to stars and galaxies beyond — among them the Spitzer Space Telescope, Wide-field Infrared Survey Explorer, Galaxy Evolution Explorer, and the European-teamed Herschel and Planck missions. 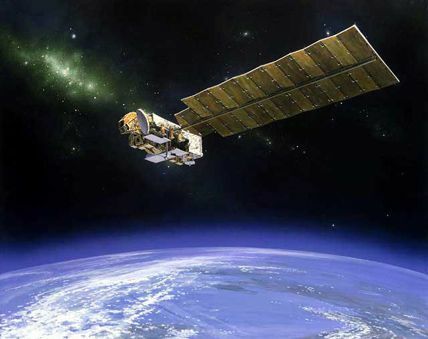 Closer to home, a contingent of Earth-orbiting satellites monitors the lands, oceans and atmosphere of our own planet, returning important information on topics ranging from atmospheric ozone to El Nino events. These include the Jason 2 satellite launched on a joint U.S./French mission to monitor Earth’s oceans. In total, JPL has 20 spacecraft and nine instruments conducting active missions. All of these are important parts of NASA’s program of exploration of Earth, the solar system and the universe beyond. These ventures would not be possible without NASA’s Deep Space Network managed by JPL. This international network of antenna complexes on several continents serves as the communication gateway between distant spacecraft and the Earth-based teams that guide them. While carrying out these exploration missions, JPL also conducts a number of space technology demonstrations in support of national security and develops technologies for uses on Earth in fields from public safety to medicine, capitalizing on NASA’s investment in space technology. The Jet Propulsion Laboratory website contains so much information, I really don’t know where to begin. The main menu includes a section for News, Missions, Multimedia (so far my favorite section) Kids, Education, Public Events, Work at JPL and About JPL. And all of those sections are broken down into subsections. There are fantastic photos, games, information pages on projects like the ongoing Cassini spacecraft, past missions, current missions, missions in the planning stages and much more. The section on climate change alone is vast and informative. You can get lost for hours, or maybe days on this site. And it’s updated regularly with new videos each month and new information about the earth and the cosmos, as it becomes available. I love this pick and I think you will too. All that belongs to human understanding, in this deep ignorance and obscurity, is to be skeptical, or at least cautious; and not to admit of any hypothesis, whatsoever; much less, of any which is supported by no appearance of probability. Wednesday: There was no chat last week due to scheduling problems. Chat will be at its regular time next Wednesday. Thanks! Do 600 unwanted pregnancies really make an exceptional story? Inroads for the ark park? When did humans first wear clothes? Why are all the birds dying? Why do women cry? Obviously, it’s so they don’t get laid. Just How Stupid Are We? Facing the Truth About the American Voter, by Rick Shenkman. There were 6,494 daily visitors this week.